The angle you create when you bend forward at address— a.k.a. “spine angle”—is important. Although your spine angle changes slightly throughout the swing, you want to maintain that basic bend until you reach your follow-through. This lets the club swing on plane and reach maximum speed. To get a feel for maintaining your spine angle, picture a bull’s-eye on the ground on the other side of the ball and mimic your backswing with a club held across your shoulders. Think of the shaft as a rifle. The goal: Point the rifle at the bull’s-eye when you reach the top (left). 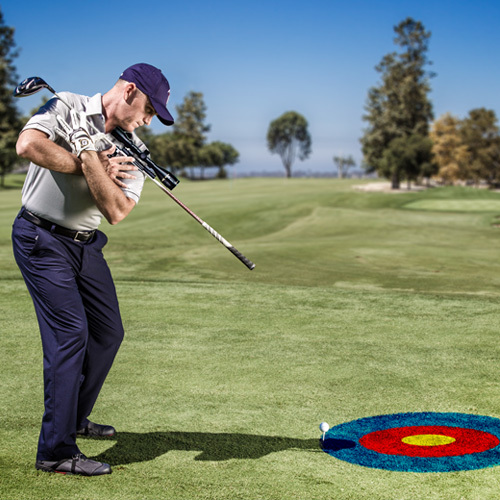 No need to aim it dead-center— point the shaft at the target just beyond the ball. If you can't, it means your shoulder turn is too flat or, worse, you’re losing your spine angle because you’re “standing up” in the swing. (It may not be your swing’s fault; most weekend players lack sufficient spine mobility, and if your upper body can’t twist enough, you have to stand up.) Flat backswings lead to steep downswings, hence your tendency to slice. 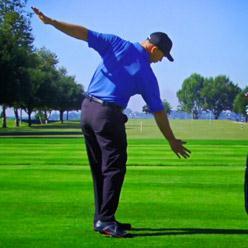 Just hit your imaginary target in this drill, and you’ll soon be hitting your real targets on the course. This exercise helps develop better flexibility between your upper and lower body, which is going to help you develop a bigger shoulder turn. This is a great exercise to help create mobility in the thoracic spine. This exercise helps you maintain your body angles in the golf swing and prevents Flat Shoulder Plane and Loss of Posture. 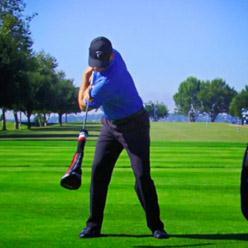 This is a great drill for the Loss of Posture swing characteristic.